When working on a project in China, I heard a worker from a millwork shop said the shop was planning on getting rid of Formica laminates because they were too expensive and too high-end. That was one of the realities I had to deal with when I was working on projects in China. It seems like everything has a cheaper replica in China. When I specified commercial grade materials from the US in China, the local vendors always could find some alternatives that looked similar or the same but half of the cost. Every commercial grade material I had specified in the US became the material for high-end residential projects in China. Now, I am curious what kind of stuff the designers specify for high-end residential projects in China? You can spot a lot of this kind of walls with plants in China. The reason why many businesses there like this feature is to give the general public the business impression of caring for the environment, but for me, it is just another example of misunderstanding of green design. 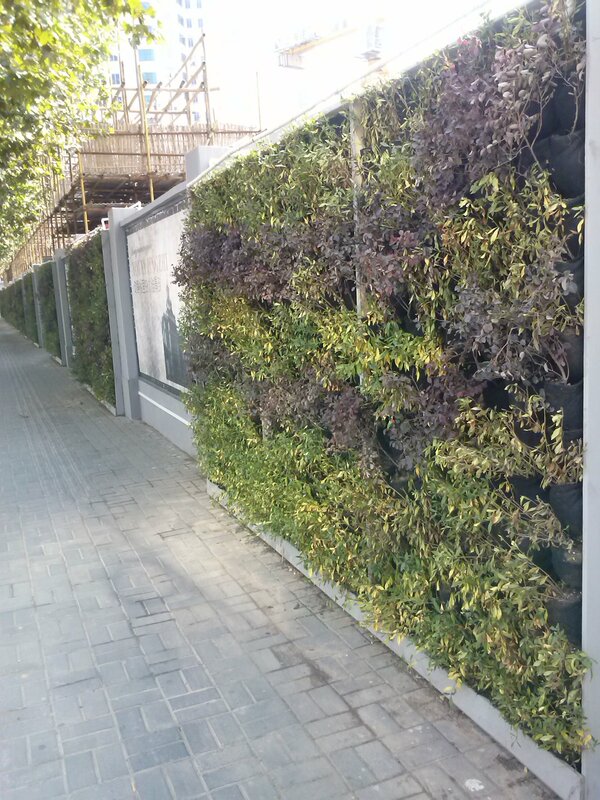 When you see this kind of plant wall on a building, it serves a purpose which is lowering the interior temperature when facing the right direction. Therefore, it helps reducing the interior temperature and cutting down the electricity used on AC for the building. It will also reduce the sunlight reflection bouncing off the walls so the temperature surrounds the building will not increase drastically which might contribute to Head Island Effect. Well, the other side of the plant walls in the photo is a construction site. Also, those plants are not the plants that you can just leave them along without giving them water, and the water they used to irrigate these plants is clean water, not gray water or rain water harvested. So, they are actually increasing the burden for natural resources on earth. Therefore, these walls might look nice but do not have any value in terms of earning LEED points or have anything to do with green design except they look green, color wise.